Print Magazines - Ruralite Services, Inc.
Want a custom magazine? Let’s Talk! Ruralite, our flagship publication, reaches 330,000 homes and businesses monthly. Currents, Florida Currents and Kauai Island Utility Cooperative Currents add a combined circulation of 128,000. Each publication is edited for a family-oriented readership and delivers industry facts, energy advice and regional highlights. Our magazines are unique. Pick a custom cover; the prime real estate on the back page is yours, too. We weave local content throughout the publication. Use your pages to spotlight local heroes, educate members on important issues and promote utility programs. The seamless integration helps your utility shine, all for about the cost of a stamp. Send us your content and we will build the pages. Love designing pages yourself? Go for it. And if you need help filling space one month, never fear. We provide shared editorial content. Once ready, every page is reviewed by three experienced editors with a bent for perfection. We have five certified cooperative communicators on staff—more than any other statewide or national industry association. We print and mail (or email) your magazine for you, too. We have three consumer-focused magazine titles to choose from based on your region and needs. Want a business-to-business publication? We can do that, too. California Water & Power is a great example. It’s the California Municipal Utility Association‘s member magazine. Ruralite focuses on activities and issues affecting readers in the west. Features highlight regional places and personalities, food and outdoor activities. Undiscovered treasures of the West are presented in each issue. Other features include electrical safety, energy efficiency and developments in the power industry. The magazine reaches more than 330,000 homes monthly through 47 zoned editions covering Alaska, California, Idaho, Montana, Nevada, Oregon and Washington. Utilities tailor eight pages of local content throughout each issue. Need more space? Just ask. The monthly magazine reaches more than 87,000 homes across Florida. Utilities tailor 12 pages of local content throughout each issue. 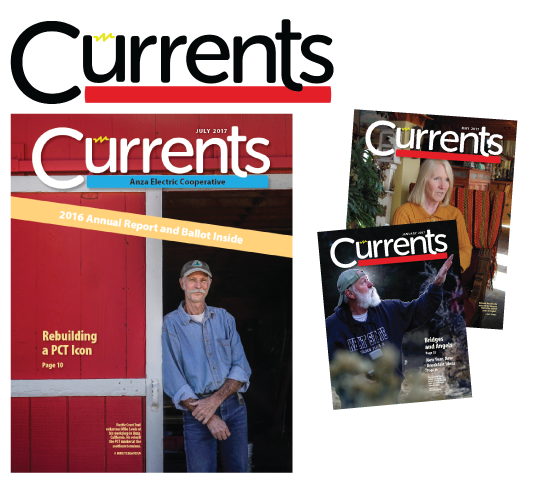 Currents magazine reaches nearly 16,000 readers in Arizona and California through four zoned editions every other month. This contemporary family friendly publication is best suited to a suburban or more urban audience. Want something tailored specifically to your needs? We can help.